War so often leads to occupation. In turn, occupation leads to struggles, clashes, and mass accumulation of scars – physical, mental and emotional. Wars started for the best of causes, the worst of causes, or no cause at all, tumble down an unfortunate yet ever so foreseeable path of destruction, for “cause” is purely subjective; good and evil zooming in and out, the mind blooming its tendency to focus only upon a definition that suits itself. But even military occupation and colonial over-takings are capable of producing cultural irony. Where those pins marked the barbed wires on some general’s map, occupation has birthed gastronomic artifacts, in controlled chaos-like environments where the seemingly bad and ugly have, miraculously, created enjoyable and even delightful edibles. Take Korea for instance. After thirty-six years of Japanese control, and at the end of the Second World War, the peninsula finally re-gained its independence, but the pure meaning of the word did not last long. In a heated political struggle to gain control in the Far East, the Soviets and the U.S. growled for influence over the newly liberated land. An invisible line was drawn across the thirty-eighth parallel, and the two world powers each occupied the north and south. After a deadly three-year war and the ensuing “time out,” U.S. military forces stayed put in the south to ensure peace and stability. War and poverty often accompany each other, and Korea shriveled in hunger for years. On a lucky day, one would get one’s hands on leftover rations from a nearby American military base – canned beans, Spam, ground beef, and everything in between. So the lucky lad throws all of this in a pot with some kimchi, instant ramen noodles if available, and other condiments depending on the extent of one’s luck. Voila, the birth of “boo dae jji gae,” or literally, “military base stew.” In the fifties, it was a symbol of hunger and the bitter aftermath of civil warfare; frantic scrambles for whatever and everything one could find from the many U.S. military posts were common. Now, ironically, it is beloved by people of all ages and backgrounds, purely for its taste. Survival instincts have become delicate luxuries of our taste buds. 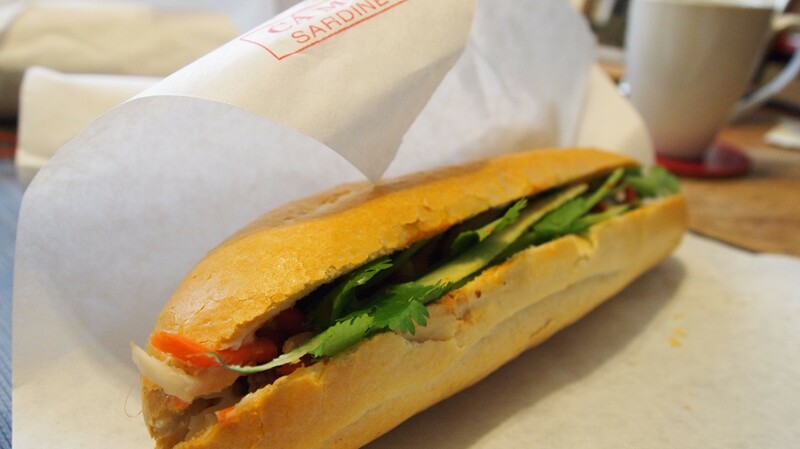 French influence on Vietnam is tastily personified in the impeccable “bánh mì” sandwich. The occupation there came not from war, but dates back to the era of French colonialism. The term “bánh mì” actually does not depict a particular sandwich. Rather, it means “bread,” particularly referring to the French baguette. As Vietnamese immigrants settled abroad, Vietnamese bakeries also sprang up, serving this “bread” with various meat and fish fillings. A few square blocks in Falls Church, VA, is home to a slew of Vietnamese pho shops and bakeries, serving some of the most authentic Vietnamese cuisine outside of Vietnam. My obsession with pho (or anything meaty in hot broth) has been well-documented on this blog in the past, as you can see here. 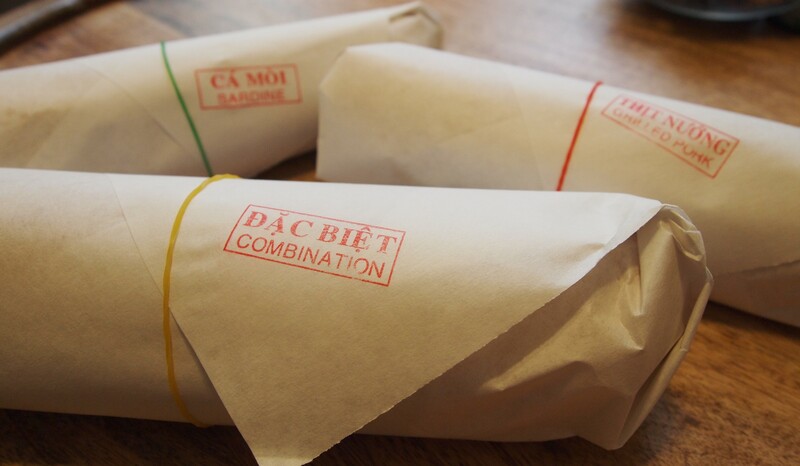 What better portrays the Vietnamese communities’ resilience and creative genius are the ways in which they adopted an utmost French ingredient (the baguette) and completely transformed it into a series of sandwiches more worthy than any rusted account of French colonial glory. Like the Koreans transforming canned beans and Spam into a national dish, the Vietnamese took the baguette (arguably a symbol of arrogance, dominance and deprivation of justice – all through colonialism) and embraced it, reconfiguring it to meet their palettes. Local flavors integrated with foreign flavors. An interlude of Vietnamese and French influences have culminated into these distinct creations right in our backyard. A cold and gloomy Saturday is forever-enlightened by a meaty bowl of pho, an assortment of bánh mì sandwiches (you buy five and the sixth is free!) and a perfectly brewed cup of coffee. The keys to a great bánh mì sandwich are twofold: good bread and mayonnaise. Located at the heart of Falls Church, Bánh Mì DC bakes their own bread, fresh every morning. The outside is just crusty enough (delivering that “crunch” with every bite), and the inside is perfectly soft and fluffy. Combined with a generous layer of mayo, the bread just by itself is rich and buttery, seemingly dissipating in your mouth. What goes inside the bread completely changes the character of the sandwich. Until recently, I was a dire believer that head cheese was the single best filling for a bánh mì. I was wrong. Head cheese is still a dominant contender, but a new world of flavors has opened for me with the sardine bánh mì. Plucked from cans, the fishy sardines go well with the pickled carrots and daikon radish, cilantro and cucumber. If you like “saba nigiri,” then you will definitely enjoy this; it’s a similar oiliness and aftertaste. Sardines plus cilantro makes you say “good.” Add few slices of spicy jalapeño to the mix, and you would say “perfect.” The mayo’s oiliness is still distinct from that of the sardines; both are ravished with oils, but somehow the two in conjunction retain their distinct flavors, enhancing the other exponentially. For those that are even remotely familiar with Vietnamese food, Vietnamese coffee – dense, compact and two words, condensed milk! – is addictive, to say the least. They know their coffee. So, to nobody’s surprise, bánh mì goes well with black coffee. Lose the condensed milk (just this once), and choose freshly roasted beans with a balanced flavor, maybe with floral notes. Dark cocoa notes would work too. “Culinary coffee” is something I have been preaching recently, where different beans with different notes “match” well with food – like wine pairing. A full-bodied, balanced cup of black coffee is a great compliment to the baguette, the mayo, the fishy-oily sardines, the cilantro, and just about everything else in that sandwich. Topics like war and colonialism do not always conceive discussions of culture and cuisine. Understandingly so, pondering upon the reasons and causes of war and occupancy usually conjures more war and more occupancy, leading to more pain and grief. In an imperfect world where internal gains of greed permeate all aspects of decision-making (for both individual and state), there will always be war, and the relatively weak will be occupied by the relatively strong. However, food has philosophy. Food is philosophy. Even if unintended (and in many cases, perfectly intended), war and colonialism leave permanent cultural imprints. At times, these imprints are mechanisms used to wipe out what remains of the indigenous culture, to be replaced by what the victor deems “superior.” At the center of such indigenous culture lies food, as people of all colors have, for generations, spoken through their food. Heritage has been passed down through food, stories have been interlocked with food, and pride has been instilled in every morsel made and consumed. Food philosophy has faced confrontation. Certainly not limited to Korea and Vietnam, food continued to be made through times of war, famine and occupation. But unlike other aspects of culture, food philosophy as so often bloomed in these times. Instead of crumbling or evaporating to be forever replaced by foreign influences, food philosophy adapted, re-molded itself to entirely new genres of gastronomical galore. Pondering these things may be the last thing one does when strolling through Falls Church to get a bowl of pho and a bánh mì to-go. But food without a story is not genuine, and food without philosophy is barren. Careful observance of food may lead to grander pictures of the flow of vast cultures. Even the least suspecting bánh mì carries an essence of Vietnamese culture. Every bite tells a tale. Every bite, therefore, is worth listening to.